"An incredible one-night-only special event!" 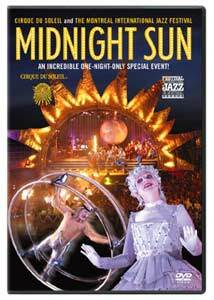 Midnight Sun represents something of a temporary departure for the renowned French-Canadian art/circus/performance troupe known as Cirque du Soleil. Unlike their stable of traditional touring shows, normally held inside a large, custom big-top, this one night only performance was held in the streets of downtown Montreal in July of 2004, as part of the 25th anniversary of the Festival International de Jazz de Montreal in front of a crowd that the backcover states is in the range of 200,000 people. This is a huge leap up from their more "intimate" shows, and much like rock bands that have had to adapt their concert act for big stadiums, Cirque has had to go for broader, less detailed strokes with Midnight Sun. There is a sense that the designers of the show were forced to go for color and movement over content in order to adequately placate such a large crowd, and while there are all of the trademark colorful costumes and ethereal music, the performances here seem almost secondary. The unique original music that has always been a key component of every Cirque show (it tells the story, if you speak French, that is) takes far more precedence in Midnight Sun, and guest performers like Youssou N'Dour and Daniela Mercury become the focus, turning some parts of the show into what is essentially a concert with costumed dancers. These criticisms are more harsh based on the controlled grandeur of former touring shows such as Alegria (the title song is performed during the closing moments here), and by comparison Midnight Sun sometimes just seems like a shadow. But this is still the Cirque, even underneath what often seems like glitzy padding here built to just mimic spectacle, and even on a bad day the costumes and general arty coolness are still small wonders to take in. The staging, a small circular area connected by a long narrow runway leading to the main stage, serves more as a place to put dancers and musicians than the performance art athletics seen in other Cirque shows. Large video screens try to convey the action to the standing crowd, but something like this was really meant to be seen up close. The small stage confines acts like the large metal wheel that a performer rolls around in, and here he is left to go in tight circles, something of a short leash on what is usually an otherwise dizzying act (though the sparks were a nice touch). Things like an aerialist dangling high above the crowd, or characters hurling themselves at a large piece of Plexiglas offer small Cirque moments, as does one of the most exciting elements a giant vertical centrifuge-like device spinning rapidly while a man rotates inside something that looks like a hamster's exercise wheel. I'm not sure who the guy with the spyglass was supposed to be who watched the show from a high perch, in front a tree made up of yellow balloons. But it is music that drives Midnight Sun, not necessarily the art/circus acts, and in between a DJ hot mixing and an army of bagpipes, there are lengthy musical interludes, with lyrics in French that perhaps drive the vague narrative. Or maybe not. It doesn't really matter, because even if the performance aspect (with regard to typical Cirque acts) is light here, the percussive score does carry this particular show. But for Cirque, that is only half of what we have come to expect. Image Transfer Review: The 1.85:1 anamorphic widescreen transfer from Sony is very strong, especially when one considers that this was shot outdoors, at night. Image quality is really impressive, with an array of vivid colors and sharp levels of detail under a variety of lighting conditions. I noticed some brief moments of fine grain (most significant on the blue backdrop during the opening number), but otherwise this is yet another showcase entry in the Cirque catalog. Audio Transfer Review: The Dolby Digital 5.1 surround track does its job admirably here, presenting the percussive, ethereal Cirque music that drives Midnight Sun with the proper amount of punchy bass and crisp highs. Directional movement is understandably minimal, but instrument separation paints a rather full soundstage across the front. Extras Review: Midnight Sun begins with a menu option to display choices in either French or English, though the subsequent choices are fairly minimal. Encore (03m:46s) is essentially a farewell song, with the cast singing and waving to the adoring crowd. An automated Photo Gallery (01m:28s) and a highlight of clips from other touring shows called Then And Now: An Introduction to Cirque du Soleil (03m:23s) are also included. The disc is cut into 19 chapters. This special outdoor performance held in downtown Montreal doesn't translate as well to DVD as the other Cirque titles, and while it is always very beautiful to look at, the constraints of the staging really limit the typical expansiveness of their shows. There are less "acts" here and more music, and because the image and audio transfers here are so strong this is very enjoyable to look at and listen to. The trappings are mostly all here, but it's just not Cirque at their most "cirquey". The music, however, is beautiful. If you're familiar with Cirque, Midnight Sun may not hold the measured charm of some of their other shows, but as expected there are many small moments display real beauty. Don't make this your first foray into the world of Cirque, otherwise you will likely wonder what all the buzz was about. See them live, or pick up Alegria or Quidam, for starters. This is only a part of what they have been.